David Kleban’s 2006 dream to open a brewery eventually came true when he and his brother, Daniel, started Maine Beer Company (MBC) in 2009. Starting super small — nano small — they perfected a single beer: Peeper Pale Ale. Eventually they outgrew their original location. In nearly ten years, they have grown into their own space with a production of around 13,000 bbls a year. That’s in a local market where they are one of 99 breweries, which actually makes Maine ranked 3rd in the nation for breweries per capita. Every bottle of MBC beer sports the motto: “Do what’s right.” It’s more than just a nice thought, too. They decided early on to make more than beer. By joining an organization called 1% for the Planet, they committed to making a difference. One percent of MBC’s sales goes to 1% for the Planet, where it is distributed to local environmental charities. I had my first bottle of Lunch — MBC’s famous whale of an IPA named after a whale — in 2013. At the time, there were fewer than 5,000 breweries in the U.S. The New England IPA as a hazy, fruity juice bomb with a velvety mouthfeel was not a national craze. Lunch was a sought after beer. Instagram and other platforms allowed beer drinkers in parts of America where MBC didn’t distribute to learn about it. And want it. MBC is still here, and even if they aren’t part of whatever fad is happening they show that quality and conviction can lead to success. 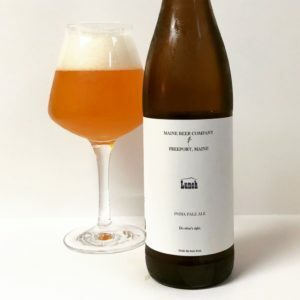 I have three classic Maine Beer Company releases to share today. Three beers that have remained vital to MBC and to beer drinkers alike. Starting as Spring Peeper Ale in 2009, MBC worked on their recipe for a pale ale until they had it just right. More than being part of a line of flagship beers, this is the beer that started it all. 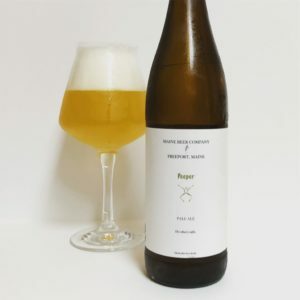 Pouring a dark straw color with a generous and creamy head, Peeper gave off an enticing aroma of rice cereal, peach and green apple, and celery. The sip is clean and crisp with a fruity — white grapefruit and unripe plum — middle that coincides with the hint of bitterness that lingers after the sip is over. I’m happy to see that, among the hazy, sometimes sweet IPAs that are prevalent, the good old pale ale seems to still have a place. It hearkens back to a time when the pale ale was a staple beer for most breweries. At 5.5%, you can enjoy this as the summer months get into the super humid time. Named for the frogs that come out in the warmer months, providing a chorus for the nighttime, Peeper is perfect for this time of year. Brewed in honor of the establishment of the Katahdin Woods and Waters National Monument in Maine, Woods & Waters is made using barley and wheat grown in Maine. The aroma is tangerine and fresh pine sap. The sip is light and citrusy with an earthy finish that is punctuated by a prominent pine resin flavor. Neither clear nor hazy, this crisp beer refreshes and pleases at the same time. 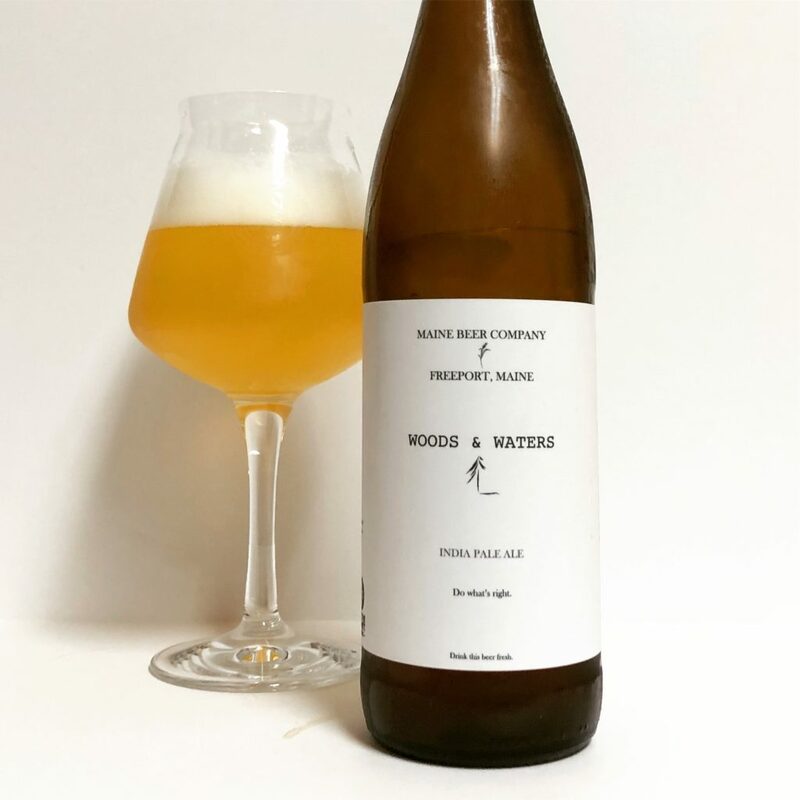 Woods & Waters is effervescent and flavorful without any sweetness. It’s perfect for sitting on the deck and watching the fireflies. If you don’t turn the bottle to read the rest of the label or visit MBC’s web site, you might be like me and wonder why this storied IPA is named after the midday meal. Well, if you did turn the bottle or visit the web site, you’d learn that it is actually named for a whale that is know for having a chunk of its fin missing. Now, Dinner, their DIPA IS actually named for the evening meal because it’s more serious than lunch. Right? Inhale as the head dissipates, and you’ll get an aroma of cantaloupe, mandarin orange and evergreen. Mmmm. After smelling sweet fruit, the sip is unsweetened and crisp with a bitter finish. As with Woods & Waters, this IPA goes down easily albeit with a slightly herbal hop bite. With all three of these Maine Beer Company beers, a common refrain is the lack of sweetness — whether perfectly sessionable at 5.5% or on the strong for an IPA side of 7.0% — and the clear and precise flavor notes. Like craft breweries two- and three-times as old, quality and consistency win the day. Dominion Wine & Beer is having Foreign Objects Beer for their beer tasting on Friday, August 10 from 5-7 p.m. with two new IPAs! Dominion will have both growlers and cans available of both.